After driving used cars for all of my adult life, we decided to sell the 140,000 mile, 2002 Saturn L300 we've been driving for the past three years. We were tired of the near constant maintenance and wanted a more reliable ride and better gas mileage for an upcoming PCS. Before rushing out to buy a car, we did four months of research on what we wanted and needed. We eventually settled on the 2015 Mazda 3 i Touring hatchback. Now I needed to learn how to negotiate and get the best price on the new car. 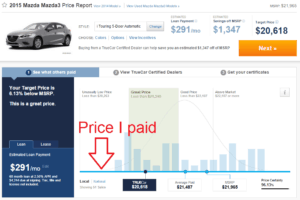 You have probably seen the commercials for TrueCar or used their service online. They promise to provide you with the real price people are paying for their vehicles. Why is this important? Because the MSRP listed on the car, or “Manufacturer Suggested Retail Price” is only the starting point when beginning to price a car. By offering prices consumers are actually paying available to you, you have knowledge. And knowledge is power, especially in negotiation. Everyone knows that the price you see on a car is not the price you pay, unless you’re a sucker. Buying a car or a house are the only two transactions where most Americans expect a bit of negotiation. If you’re bad at negotiating, or don’t know how to, it can be an intimidating prospect. Just remember: Cars are a commodity, like salt or a barrel of oil. Whether you buy it from Billy Bob’s Mazda Emporium or Main St Mazda, it doesn’t matter. All the vehicles were manufactured in the same factory by the same company. As long as they have the same make, model, trim levels and features, the only reason to buy from one place versus another is the price they offer you. Salesman will often attempt to appeal to your emotions when buying a car. One guy told me I should come in because we exchanged a few emails. Really? That took up how much of your day? When you’re spending more than $15,000 on a single purchase, does it make sense to buy with your head or your heart? I think cutting the BS and buying with your head makes the most sense. Going into purchasing a new Mazda 3, I knew I didn’t want to get ripped off in the process. I’d never bought a new car before and the car salesman I was buying from has probably sold hundreds of cars. How can I possibly win in this scenario? By harnessing the power of the Internet. I would make the dealerships compete for my business, quickly and easily over email. Emailed the five closest dealers to me, asking for their best offer. Once I have the best offer, ask the other four to beat it. Continue until no one will come down in price any more. So now I had a price starting point to start talking to the dealers with. Remember that the price dealers often quote you doesn’t include tax, title, or registration, which can easily add 10% or more to the cost. To make it easier to compare apples to apples, I’ll only compare the out the door price, and I only asked dealers to send me their out the door price. This allows them to structure the deal however they want internally. I don’t care how they set it up, I just care about the price I pay. I'm interested in purchasing a new Mazda by the end of December. Could you please provide a price for a 2015 Mazda3 i Touring 5 Door (hatchback) Automatic? Please specify all applicable fees and add-ons including destination and documentation fees, floor mats, splash guards, etc. I'm interested in this model in Blue Reflex Mica color. Again, I'm interested in acting quickly, so please provide as much information as possible on your available cars including the VIN#(s) so that I may make an informed decision. Thank you for your time, I look forward to working with you to buy my new Mazda! Thank you for the response. For your information I am an active duty military member and do not currently own a Mazda. I am not sure yet whether I will be financing through Mazda, financing on my own, or paying cash. My current best offer is $19,753 ($500 military incentive included) + $150 documentation fee + tax, title license for $21,476 total. If you are able to beat this price, I would be interested in giving you my business. Could you please let me know the best total price you are able to offer? I'm interested in purchasing between December 18-31, so please provide as much information as possible on your available cars including the VIN#(s) so that I may make an informed decision. I look forward to hearing from you Tuesday morning. He told me whoever was selling me that car was taking a huge loss and the best he could do was take $100 off. I told him he needed to make it worth my time to drive over to his dealership and saving $100 wasn’t really worth it. He could not beat the price, so Jerry (Dealer B) won the bidding! I called Jerry and told him to have the car ready to be picked up the next day. After 30 minutes of paperwork signing, I drove off in my new 2015 Mazda 3 i Touring 5 door hatchback. I paid $20,881.59 out the door price and saved $2172 off of the USAA Auto Circle/TrueCar price with only a few minutes to send a few emails. That puts me at the far left end of the TrueCar bell curve, where you should aim to be. Just a couple of things I would do differently next time I go to buy a new car (probably in 10-15 years). I’ll get them to take the “documentary service fee” off. It’s a $150 fee that is not required by state law. Should have read the contract a bit closer. Also, I wouldn’t let them know that I wanted to finance or was willing to finance early in the negotiation process. 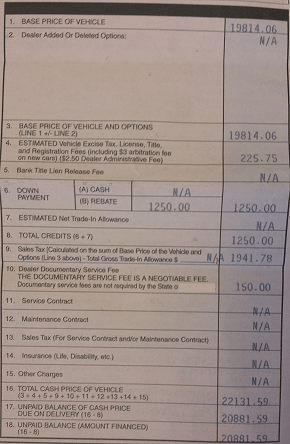 If you finance through the dealership, they can usually offer rebates. This allows them to lower the price artificially. If you negotiate based on a cash price and then add financing rebates later, you can probably save even more than I did. The biggest waste of my time was actually going to the dealership. They make you sit there, put numbers that mean nothing in front of you, draw pretty pictures for you: it’s insulting. I don’t care about monthly payments. The salesman didn’t even know that the 2015 models came standard with fog lights, something my wife pointed out to the guy. It’s embarrassing when you don’t even know the basic stats on the cars you’re selling. Finally, the biggest lesson I learned was do your research. Know what car you want before contacting the dealership to purchase. Four months before we made the purchasing decision my wife and I test drove a Toyota Prius C, Ford Focus, Ford Fiesta, and a Mazda 3. The Mazda 3 was the best drive and had the features we wanted standard with nothing extra. So we knew what we wanted when we starting sending out the negotiation emails. This made it easier to negotiate. Do you have any techniques for getting the best deal on a new car? Do you think I could have gotten a better deal? Do you ever actually enjoy going to a car dealership? Great Website! A lot of useful information! I was actually wanting to buy a 2015 Mazda 3 myself but I ended up getting a 2015 Kia Optima per my wife’s “request”. 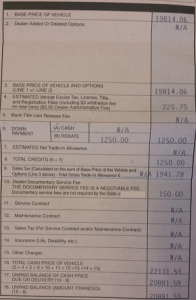 I did a similar technique, but one thing I found out and regret; Most dealerships, if not all, charge a finance fee or lease fee on top of the out the door price. This is usually done when you meet with the finance department. In our case it was over $2000. If I would have noticed it sooner, I would have chosen to finance with USAA instead of accepting the $750 finance rebate from manufacturer. I’m confused: How does a “$750 finance rebate” from the manufacturer cost you money rather than saving you money? 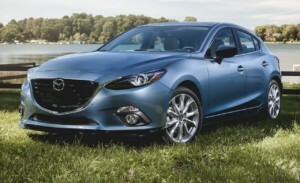 Since the dealer I’m negotiating with for a Mazda 3 is offering .9% financing I can’t see financing any other way.